The sherry triangle, Solera, Flor, Albariza, the south of Spain, hovering over shining soils between Cádiz and Seville, is a world of words that all pertain to one of the most famous, romantic, complex, yet misunderstood wines of the world. Jerez-Xérès-Sherry is one of Spain’s official demarcated wine regions and almost all the grapes are grown in a wobbly triangle between the three towns of Jerez de la Frontera, Sanlúcar de Barrameda and El Puerto de Santa María. This is a land of flamenco, señoritos, clapping hands and Arabic wailing, eternal sunshine and bullfighters. It is a place where the earth glimmers white under the hot southern sun: albariza, the calcareous soil that helps retain water in the long summer months. And the hardy little grapes, Palomino Fino, the bland base white wine that is the tapestry upon which the sherry makers create their masterpieces. The drive south was long, uneventful - passing by the long fin of the Gredos mountains, down through the scorched Savannah of Extremadura and flirting with the Giralda of Seville - but worth it. Jerez de la Frontera arrived, compact, important-feeling and white-walled. Fino - Make your base wine from the Palomino Fino grape and then fortify it with grape spirit to about 15%. Leave it in a barrel for 6 months - the sobretabla period. Then add the wine into the barrels, never filling any barrel more than 75%. Due to the humidity present in this part of Spain, and the space of oxygen left in the barrel, a layer of yeast - flor - grows over the top of the wine. This protects the wine underneath and keeps them from oxidising. Barrels are all stacked up in layers called criaderas in what is called the solera system - the bottom layer is also called the solera layer, just to be confusing. The wine to be bottled from that year is taken from the bottom layer; but no more than around 30%. Wine from the next layer up - criadera #1 - is then transferred down to the bottom layer. This leaves a 30% reduction in criadera #1, so wine is transferred down from criadera #2 and so on all the way to the top. The top criadera receives the wine made that year - the wine from the sobretabla. Fino is usually in this system for around 3 or 4 years. This is called ‘biological ageing’. Amontillado - The yeast in the Fino system may die after about 7 years or the winemaker may increase the alcohol to kill the yeast. Should this happen the wine becomes exposed to the oxygen and start to oxidise. Just like when you bite into an apple and it starts to brown. The wines turn amber and becomes richer in flavour. This is the combination of ‘biological’ and ‘oxidative’ ageing. Jerez hums with all the tropes that one can associate with Spain. The walls, when old, are crumbling and medieval or white as bone. The streets are narrow and cobbled or are wide enough to let horses and carts pass. The locals, by and large, are loud and attractive; this being the Spain of peoples hewn from Moorish and gypsy blood and bronzed in the heat. The usual over-brimming selection of ancient churches and squares are added a Mediterranean character by the dots of colour that peal out from the orange trees planted at every turn. The city, for though it feels quaint at its heart it is a city, and a hundred years ago was the third richest in the country, is ancient. Indeed the shambling ramble of the Alcazar bears witness to the ruins of the Moorish period. Despite all the history drowning the place, the Gothic and Baroque grandiosity of the cathedral, the Mudejar-Gothic austerity of San Dionisio and San Marcos, the haughty loftiness of San Miguel, the main temples in Jerez are shrines to one thing: sherry. Great names: Domecq, Tradición, Fundador, Lustau, William & Humbert, Sandeman, Harveys. Names and logos. 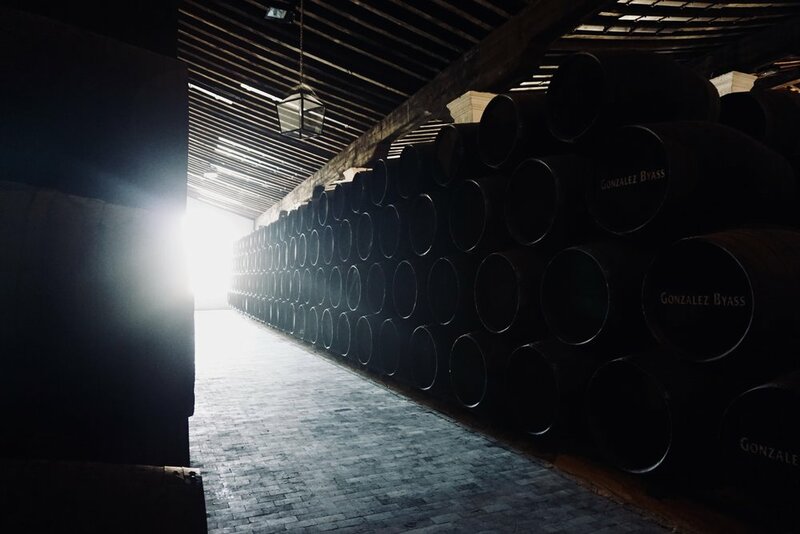 Manuel María Gonzalez stands, a hand in his pocket, mutton chops curling round his chin, with one hand resting gently on a barrel with the words Tio Pepe: the world’s most famous Fino. A statue of course, standing primly as a saint next to the cathedral. Inside Gonzalez-Byass the world smells of wood, fermenting must and fresh green leaves. Infinite casks, piled up high on top of each other and covered in dust; alleys, that were once public roads since swallowed by the might and spread of the bodega, wind around white walls under a canopy of decorative vines; a little glass of sherry sits on the floor, crusted with decades of grime, with a tiny ladder attached - an offering to the mice to divert their attention from the main butts; huge celebratory barrels named after the apostles; smaller casks signed by celebrities; and of course the ever present Cordoba hat-wearing red-jacketed bottle of Tio Pepe himself. It was a visit to the greatest of sherry superstars. Palo Cortado - This is a rare, mysterious, and impossible-to-engineer style of sherry that seems to be what happens when the yeast preemptively dies in the Fino barrel. Unplanned oxidation thus occurring. They are somewhere between an Amontillado and an Oloroso. It is a wonderful error. Expensive and smooth. Nighttime in Jerez. The tabancos come alive. These bars are the lifeblood of the city. The genetic make-up is dark wood, chalk and sherry wine. At El Pasaje we drank liberally, small pourings into miniature tumblers served with aged cured sheep’s cheese, chicharrones (a cured fatty pancetta style ham, sliced thin and bespeckled with crunchy salt and lemon juice), and some tangy boquerones (white anchovies cured in vinegar, parsley and garlic). The orders were scribbled on the bar with nubs of chalk, flamenco filled the back corner, a young boy clapped the palmas and wailed his cante hondo as two ladies stomped their feet and an man, his father?, plucked a guitar. At San Pablo, with its stout tables, recreational solera decorations and white walls, we ordered cazón (marinated dogfish chunks that are breaded and deep fried), a montadito de pringá (a small sandwich containing shreds of slow-cooked meats) and carrillera (slow-cooked pig cheek). These tapas accompanied by a colour-card of wines. Bar Juanito, famous and prettily located as it is, offered up some lacklustre artichokes cooked in Tio Pepe, and El Guitarrón de San Pedro was closing early so we only had time to knock back a drink. Fortunately we could continue our sherry binge at La Pandilla; a grand room decorated with those old Spanish posters of bullfighters and flamenco dancers. The clientele was well-heeled and smartly dressed despite the rustic nature of the establishment. More wines were ordered as well as alcoholic mosto: fermented grape juice that hasn’t quite become wine and is only available from November. Spanish Beaujolais Nouveau. 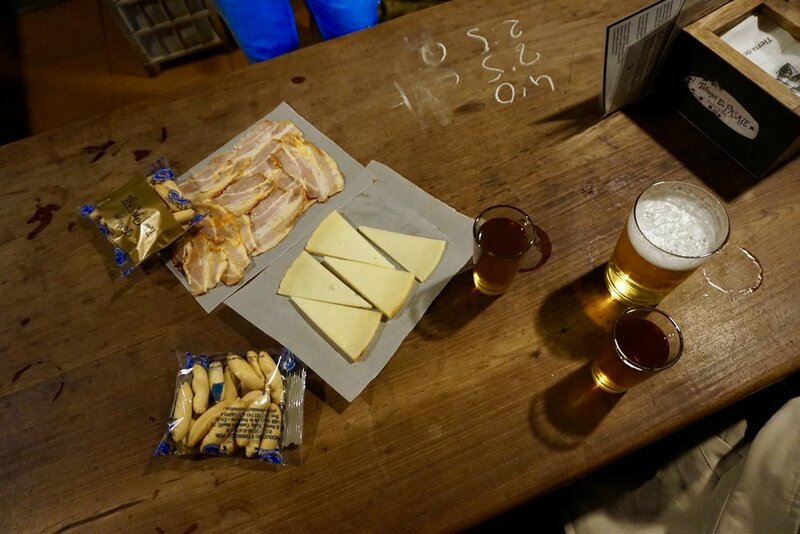 On the classic greaseproof paper ‘plates’ we ordered queso de Ocaña (a very punchy Manchegan cheese) and carne mechada (cured pork that has been cooked in its own fats with garlic and bay leaf). Oloroso - The lightest wines are usually chosen to become Fino/Manzanilla. More robust whites may instead be selected to become Oloroso. It follows the same solera method, but the wines are fortified up to 17/18% before they go into the barrels. This is too much for yeast to handle, so it never grows. As a consequence the wine starts to oxidise immediately. Thus this wine doesn’t experience any ‘biological’ ageing, just ‘oxidative’. The wines turn a lot darker and fuller as a result. Pedro Ximénez - A different style of winemaking using the Pedro Ximénez grape, or PX. These grapes are dried on straw matts under the beating sunshine and essentially turn into raisins. Wine is made from these sun-dried grapes, fortified to 17/18%, and then similarly popped into the solera system. These are lusciously sweet, rich and viscous. Dark and sensual wines. Streaming westwards along the banks of the Guadalete like some an audition for Cadiz-on-the-Water, El Puerto de Santa María cut an odd figure. Without a doubt scruffier and more down at heel than Jerez or Sanlúcar, it no less had its charms and still bore a modicum of potency when the names Osborne, Grant and Gutierrez Colosia were spotted. As if to remind us of its heritage, the giant bullring is the third largest in Spain. The town is fairly flat, rising gently away from the river in a sequence of attractively nondescript streets that took most of their names from people alive or saintly: San Bartolomé, Virgen de los Milagros, Santo Domingo, San Francisco, Santa Lucia, Federico Rubio, Elias Ahuja, Fernán Caballero, Pedro Muñoz Seco. A millennia could be spent just researching the names in one Spanish city. The hulking stack of the main church and the pop-up book charm of the castle added a sense of age to the place, but it was what it was: a port. The orange trees huddled together in minute squares while people stood outside drinking small glasses of wine. Wooden boats of all sizes gently listed in the swift current and the sun was starting to throw long shadows over the concrete. Guadelete came from the Arabic ‘river of forgetfulness’. I wondered how much that could be attributed to alcohol. I wish I had longer there, but we had to drive back into the chalky albariza fields to complete the last point of the triangle. Manzanilla - Manzanilla is basically a Fino that can only be made in Sanlúcar de Barrameda. Actually it is a distinct wine region. It is made in exactly the same way. The difference is the flor; that yeast layer. In Finos from Jerez and El Puerto, the yeast sometimes cracks and breaks during its lifetime, especially in winter, before reforming. In Sanlúcar it is so much more humid all year round that the yeast is constantly fat and present, so the resulting wines are the lightest and brightest and driest of all the styles. Sanlúcar is a place that balances an absurdity of life and conviviality with deathly quiet and space. In wintertime the enormous beach, that in August hosts one of the oldest, and easily the most picturesque, horse races in Europe, is empty. Kite surfers whip around in the surf, but the long sands are un-peopled and the holiday homes shut up. 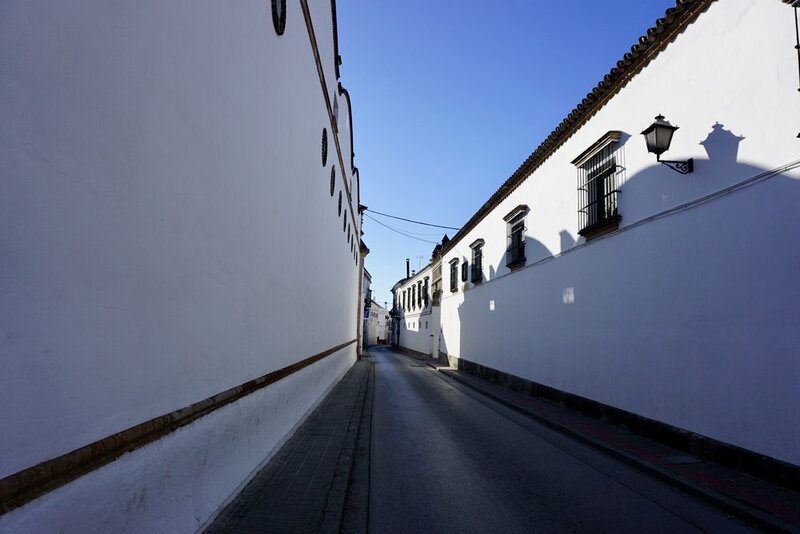 This town is the home of Manzanilla and Delgado Zuleta is the oldest winery in town and also the oldest in Jerez county. The classic La Goya wine was selected for the royal wedding of Felipe VI to Letizia; chosen blind at a tasting. I was looking forward to visiting. Unlike Jerez and Gonzalez-Byass, the bodegas out in the triangle attract far fewer people. There were five of us in total. As always, the outside was white walls, triangular roofs and decorative grapevines. Inside was a similar story: dank high rooms stacked full of butts that were dusty the touch. Mould clung to everything; about 4% of sherry stock is lost through natural evaporation or, ‘to the angels’, as they have it. The Manzanillas were bright and soft and still flirted with the idea of having fruit on the palate. Back at the shop locals were starting to park up and bring in empty plastic bottles to fill up ‘a granel’ from the casks themselves. On tap, direct from the winery sherry. 4.90€ a litre. I pondered either one day buying a holiday home down in that part of Spain or at least rekindling a short-lived relationship with a passionate and insane Jerez girl I once dated years ago. Sanlúcar had more of a flair to it. The castle, less pretty than El Puerto’s, sat on a hill next to the gargantuan Barbadillo winery. Churches, convents, skylines. Everything was white and was cleaner than my last visit, though it still had that gaditano charm of peeling walls. Salt wins every time. Plaza Cabildo was our choice to eat. A gorgeous little square of eclectically mismatched buildings stuck together round a large fountain. Bars were spilling out everywhere. Here was Andalusian life back in the fore. At Casa Balbino, a bar that seemed impossibly full, we ordered massive tortillitas de camarones (shrimp fritters), ensaladilla rusa (Russian salad), and kidneys cooked in sherry wine. Waiters, looking identical with their receding hairlines, red waistcoats, blue shirts and incomprehensible local tongue, sloshed out generous glasses of Manzanilla. Ham legs hung from the ceiling, spider crabs sat on the bar, aubergine and prawns looked out from behind glass, and bull heads stuck out from the walls. Anywhere else it could have been kitsch. Further wine was had at Bar Barbiana. Own brand glasses of 1.20€ Manzanilla flew out and were knocked back with papas aliñás con melva (potatoes marinated in olive oil, parsley, onion and sherry vinegar and topped with cured tuna). To burn off the effects of the wine we strolled the cute cobbled lanes, past La Gitana, another icon, and decided it was probably time to head back home. The drive back to Madrid gave us time to reflect. At Córdoba we ate various local dishes flamenquín (breaded rolled up serrano ham stuffed with cheese and deep fried), ajo blanco (a spread-like mix of almonds, garlic, oil and vinegar) and drank glasses of Montilla-Moriles fortified wine. But that’s another story for another day. In Madrid it is a constant battle to find sherry temples but they do exist: Sanlúcar, La Venencia, Palo Cortado, Casa Baranda, La Caleta. But again, another time. Sherry is alchemy in a glass and is worthy of your time and your wonder. So go out, find some and drink as much as you can. I did.